Upgrade work continues at Del Amo Station this weekend and next week on the Metro Blue Line. Planned improvements are similar to those completed over the past two months at the Long Beach stations, including new canopies, paint, tile and audio/visual enhancements. Compton is the next station slated for upgrades, and will be closed for three consecutive weekends starting next Friday evening, Mar. 13. This weekend, Friday, Mar. 6 after 9 p.m. through Sunday, Mar. 8 close of service, bus shuttles will replace trains between Artesia and Wardlow Station, matching the service levels of Blue Line rail. This means southbound Blue Line trains will return north to 7th Street/Metro Center at Artesia, and trains originating in Downtown Long Beach Station will travel only as far north as Wardlow. 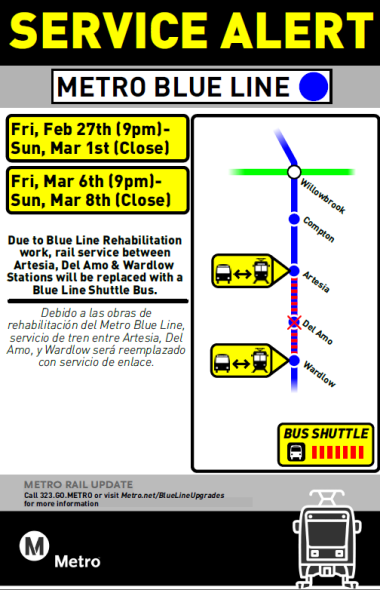 Customers wishing to travel between Artesia and Wardlow Station will need to board Metro bus shuttles (marked as “Blue Line Shuttle”) in order to do so. Friday, Mar. 6 after 8 p.m., the Metro Blue Line will run every 15 minutes between Long Beach and Wardlow, and every 20 minutes between Artesia and downtown L.A. Metro Expo Line will also run every 20 minutes after 8 p.m.
Saturday and Sunday, Mar. 7 through 8, Metro Blue and Expo Line trains will arrive every 15 minutes the entire service day. For those riding the Blue Line next week: After 8:30 p.m. Blue Line trains will run every 20 minutes between Willowbrook and Long Beach and 10 minutes between Willowbrook and 7th Street/Metro Center Monday, Mar. 9 through Thursday, Mar. 12. Trains will share 1 track at Del Amo Station, where upgrade work will still be in progress. There will be no bus shuttles. A couple weeks ago when the bus shuttles started at Del Amo station I got on the shuttle and it got lost. We ended up in Wilmington, where all the refineries are. Took us 30 mins to go from Del Amo to PCH station, almost a 2 hour trip from 7th st to Long Beach.